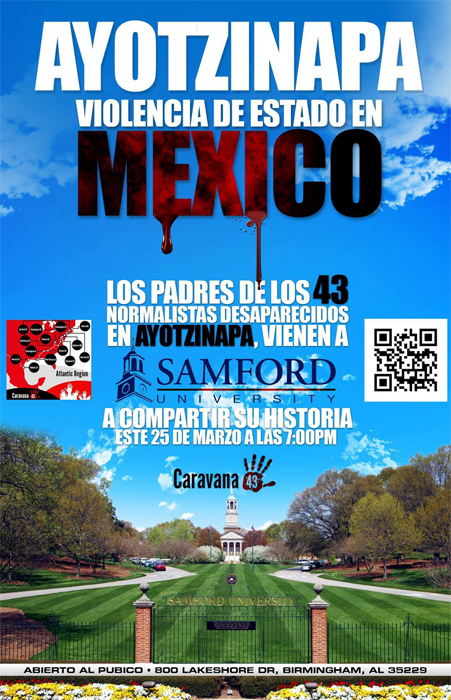 Samford University will host a special public event March 25 to highlight the disappearance of 43 students from Mexico’s Raúl Isidro Burgos Rural Teachers' College of Ayotzinapa in 2014. The “Ayotzinapa 43” disappeared Sept. 26 after being detained by police and delivered to a local crime cartel. The parents have continued to demand that their children be returned to them. So far, only one of the students has been identified among the remains in a mass grave. For many, the Ayotzinapa 43 have become a symbol of the more than 100,000 murdered and 25,000 disappeared in the last eight years of the US/Mexican Drug War. The parents of the students are traveling in three caravans throughout the U.S. through April, calling for justice and accountability, and shedding light on the violence in Mexico. Amnesty International and many other human rights organizations, as well as the U.S. State Department, have for years found Mexico in violation of human rights through arbitrary arrests, torture, and extrajudicial killing. The “Caravana43” group hopes to build bonds between the people of Mexico and the United States who interested in social justice. "The invitation of people of the United States to share our struggle is very timely since our plan is to travel to Central and South America and to Europe from where we have already received more invitations," said Felipe de la Cruz Sandoval, a representative of the group. "It is important that both citizens and government leaders of other countries are aware of the injustices in Mexico and the international community see what is the globalization of repression," Sandoval said. The parents also plan to take their case to the Inter-American Commission, Amnesty International and the United Nations. Carlos Alemán, director of Samford’s Latin American Studies Scholars program, said the visit is a reminder of Birmingham’s role in the U.S. Civil Rights Movement, and demonstrates the demographic growth of the Latino population in Alabama. Aleman said the visit “also makes clear that Samford University is a destination point for people who are interested in discussing and learning about international human rights and social justice issues." The parents will speak at several Birmingham area events March 25. At 9 a.m. the group will offer a media conference at the Birmingham Civil Rights Institute (BCRI). At 10 a.m. they will take part in a public forum at BCRI. At 1 p.m. the parents will meet with representatives of local Spanish-language media. At 7 p.m. the parents will present a free public event on “Ayotzinapa: State Violence in Mexico” in Samford’s Reid Chapel. While in Birmingham, the group will be hosted by Ayotzinapa Caravana43 Birmingham, a local coalition that includes the Latin American Studies Program at Samford University, Adelante Alabama Worker Center, Immigrant Alabama Movement – Birmingham, Greater Birmingham Ministries, Birmingham Civil Rights Institute and Hispanic Interest Coalition of Alabama.